PUNE: To de-addict the youth it is necessary that parents to spend quality time with the children, teachers should guide the students in selecting appropriate role models and to help build up the confidence,” said Mukta Puntambekar, Deputy Director of Muktangan Mitra, Project Director of Muktangan Rehabilitation Center, Pune. She also brought forth the point how the addiction to alcohol is increasing among women too in recent times. 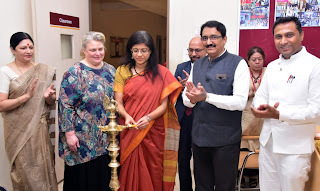 She was speaking at the inauguration ceremony of Suryadatta Global Rehabilitation Centre for De-addiction (SGRCD) which is formed by Suryadatta Group of Institutes to build addiction less and moral, holistic society. Dr. Sanjay Chordia, Founder of Suryadatta Group of Institutes, Dr. Sushma Chordia, Vice-President of Suryadatta Group of Institute, Yashraj Parakhi, Chairman & MD, Parakhi Promoters and Developers, Dr Sushil K Sharma, Associate Dean, Miller college of Business, Ball State Universituy; Dr Mary Theresa Seig, Assisstant Provost, Rinker Centre for International Progress, Ball State university; and Mr Rahul Jain, Co Founder Innoserve were present on this occasion. In this session, Mukta Puntambekar gave a presentation, listing out the various kind of addictions like Alcohol, Tobacco & Social Media; reasons for addiction, the chief being stressful lifestyle & peer pressure; identifying the signs of addiction; and how to deal with it. She stressed upon the need for parents to spend quality time with the children, for teachers to guide the students in selecting appropriate role models and to help build up the confidence.